Barely before contractors had time to read the regulation and attendant DOL guidance, however, and prior to its first effective date of October 25th, a group of industry trade associations filed a legal challenge in a Texas federal district court to the rule and requested the court grant emergency relief by enjoining the government from enforcing its cornerstone self-disclosure — “blacklisting” — provisions. On October 19th, U.S. District Judge Marcia Crone of the U.S. District Court for the Eastern District of Texas accepted the arguments set forth by industry plaintiffs and granted a nationwide preliminary injunction, which blocks the government from enforcing the “blacklisting” portions of the rule until the overall challenge to the legality of the rule is concluded. In addition, the Judge concluded that the industry plaintiffs had “properly demonstrated” that their members would suffer “immediate and ongoing injury” had the rule been allowed to take effect. Judge Crone also found that contractors would face significant burdens in implementing the compliance scheme necessary to comply with the rule as proposed. Accordingly, the blacklisting portions of the rule are now stayed pending further action by the district court. This is a significant victory for government contractors, however, it is important to note that we are in only the first stages of the legal challenge to the rule. Although certainly a good sign of how the court views industry’s arguments that the rule violates contractors’ First Amendment and due process rights by forcing bidders to disclose mere allegations that have not been adjudicated, and that the rule constitutes an unprecedented overreach of executive authority into matters previously controlled by Congress, there are no guarantees at this stage of the litigation that the regulation will be permanently struck down. Judge Crone’s ruling could change after the full hearing on the rule, or it could be narrowed or reversed on appeal, or the government could even amend the rule to some sort of “blacklisting-light” regulation, so contractors may still ultimately be required to implement the rule’s requirements. Thus, contractors should not discard the preparations they have made for implementation of the rule. Rather, continued preparation for compliance, with the expectation that the blacklisting rule will continue to exist in some form or another, is warranted. Note that the current court injunction does not impact the rule’s pay transparency provisions, which requires federal contractors to provide wage statements and information to workers regarding their hours worked, overtime hours, pay, and any additions or deductions to their pay starting on January 1, 2017. In terms of preparation for future implementation of the Blacklisting Rule from the OSHA perspective, our OSHA group previously blogged about this rule when it was a proposed rule. However, with the final rule has come some clarity around how the rule will be implemented by contracting agencies and the Department of Labor. The final regulation establishes a complex mechanism requiring a “responsibility determination” to be made to determine whether to issue or reject prime contractors’ bids, or in the case of an existing contract, to rescind the contract, and for all contractors to consider debarment proceedings. DOL guidance issued with the final rule makes clear that the determination will be based on only those OSHA citations (or other alleged labor law violations) determined to be “serious, willful, repeated, or pervasive.” While this limitation may sound like a limitation, applied in the OSHA context, as we have previously reported, it provides cold comfort to responsible contractors. 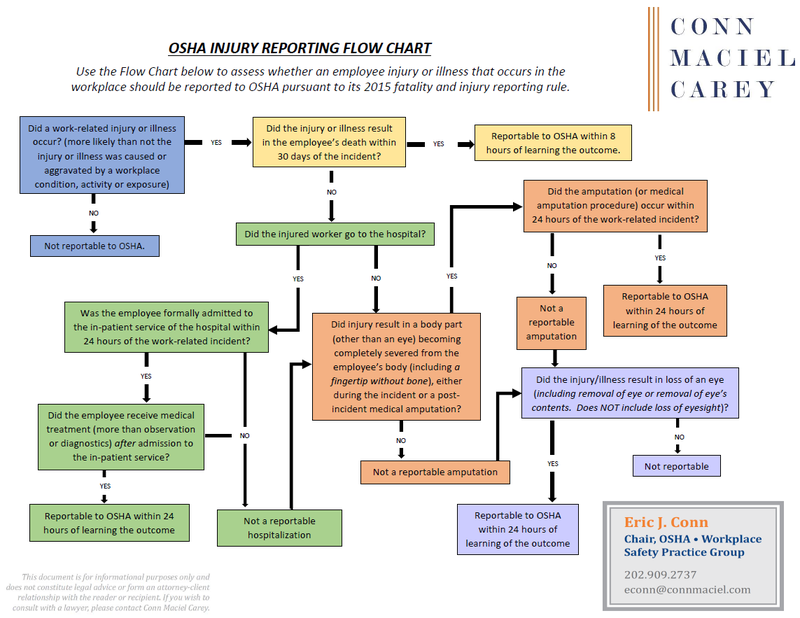 A review of recent OSHA enforcement data shows that the vast majority of citations issued — upwards of 85 percent — are initially characterized as serious, repeat, or willful (75% just as willful). 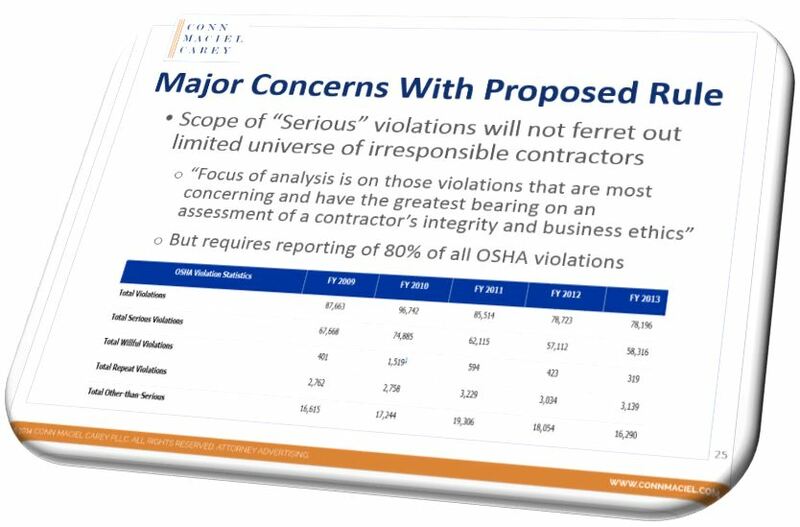 This means that virtually all OSHA citations fall within the category of labor law violations that the regulation identifies as the type that most seriously threaten the contractor’s responsibility determination. In essence, these Labor Compliance Agreements allow OSHA to circumvent an employer’s important right to stay abatement of a citation pending the outcome of a legal challenge to the citation, and will subject federal contractors to unique requirements OSHA has not been able to accomplish through rulemaking. There are no limits on the types of remedial actions that can be required in these agreements. OSHA can use them to force contractors to prematurely implement not only OSHA’s suggested abatement, but also a slew of other onerous requirements, such as an injury and illness prevention program (I2P2), ergonomics standards, heat stress programs, third party audits, heat illness and workplace violence policies, etc., none of which are required under OSHA regulations. Thus, if the stay of the rule is lifted, these new Labor Compliance Agreements will likely serve as mechanisms to allow OSHA to “back door” in requirements on federal contractors that OSHA has not had the political or scientific support to promulgate as mandatory standards. The contractor’s labor record demonstrates a satisfactory record of integrity and business ethics (the contractor is good to go). The contractor’s labor record is not clean, but does not warrant disqualification, so the contractor must negotiate a Labor Compliance Agreement before the contract award. This occurs where the ALCA thinks there are risks of future violations, so the ALCA can recommend a Labor Compliance Agreement be negotiated with the citing agency (e.g., OSHA). If the contractor needs an enhanced safety program or some other enhanced safety program, that would be brokered in the agreement before the contract is awarded. The contractor’s labor record is not clean, but it is not so tainted as to hold up the contract aware pending an ALCA. Here, the contracting agency and ALCA can solicit a commitment by the contractor prior to contract award that it will negotiate with the ALCA to enter into a post-award Labor Compliance Agreement. The contractor’s record of integrity and business ethics, as reflected by the contractor’s lack of compliance with labor laws, is unsatisfactory. Here, the contracting officer should refer the contractor for suspension or debarment. We are closely watching the Texas legal challenge. Its outcome will have a significant effect on companies engaged in federal contracting at both the prime and subcontractor level, and if the stay is lifted, the rule will give OSHA an unprecedented seat at the table in federal contracting policy through the ALCAs and Labor Compliance Agreements. Stay tuned.